(EW.com) -- Every superhero movie is, on some level, an attempt to demonstrate that a godlike being with flabbergasting powers — he flies! He wields a megaton hammer! — also has an inner life. The success of the film hinges on how well it yokes together the external and the internal. "Thor: The Dark World," a watchable but technologically over-scaled slab of Marvel boilerplate, is far from a great superhero movie — it's more like the diagram for one. Having done his time as a magical Norse hunk-out-of-water in "Thor" (2011) and "The Avengers" (2012), our hero (Chris Hemsworth) now finds himself back on Asgard. There, his father, Odin (Anthony Hopkins, serving up his own special brand of highbrow scenery chewing), enlists him in a battle for the cosmos. The Nine Realms are about to converge, which means that the Dark Elves, led by the scowling Malekith (Christopher Eccleston), can now finally seize their moment to destroy Asgard. Are your eyes already glazing over? To succeed, the Elves must gain control of the Aether (pronounced ''ether''), a supreme energy force in the form of what looks like a floating spill of red wine. In the film's rather desperate attempt to personalize the plot, the Aether, which requires a host organism, has leaped inside the body of Jane Foster (Natalie Portman), the astrophysicist who fell for Thor and has been waiting two years for him to return. Portman plays her like a petulant schoolgirl, and that's the movie's notion of a joke: Jane just wants a boyfriend, while Thor, who loves her back, has weightier concerns. Really, though, "The Dark World" should have given Jane a better reason for hanging around than the fact that she's playing host body to a glob of extraterrestrial protoplasm. The first "Thor" was directed by Kenneth Branagh with an elegant verve that made the special effects at once witty and spectacular. Alan Taylor, who directed this sequel, is a prestige veteran of the small screen ("Mad Men," "The Sopranos," "Game of Thrones"), but he brings little of that avid storytelling tightness to "The Dark World." The new film sprawls, often with more spirit than reason. And though its images can be exciting (the Oz-like palace of Asgard, airships that glide like daggers), the battles have a videogame medieval dazzle that temporarily heightens the senses, then leaves you numb. 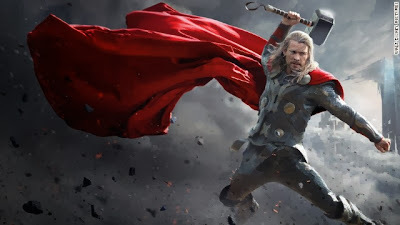 Hemsworth's Thor is once again a charismatically fast and bold stud-Viking warrior, but now that he's mostly on his home planet (with occasional forays down to London), he somehow seems less super. Only when Tom Hiddleston is on screen, as Thor's dark-souled stepbrother, Loki, does any real drama take hold. Loki has been imprisoned for his treachery, but it turns out that Thor needs his help to defeat the Dark Elves. Can he trust Loki not to betray him? Hiddleston, with pleading eyes and a mad-dog grin, plays Loki as a wounded sociopath who's cackling at the world but seething on the inside. Which makes you realize he's just about the only character in the movie who has an inside.